Jaffa was regarded as a brilliant student of conservative politics. The National Review hails him as a "towering scholar." He established himself in the 1950s as both a prominent student of political philosophy as well as one of the nation’s leading scholars on Abraham Lincoln. He also assisted presidential hopeful Barry Goldwater during his failed 1964 bid for the White House. Breitbart News calls him the "prophet of a uniquely American Conservatism." Jaffa was also a prolific author of books and articles, and at CMC held the post of Henry Salvatori Research Professor of Political Philosophy until his retirement in 1989. According to historian Kevin Starr, in his history of Claremont McKenna College's first 50 years, Jaffa's arrival at CMC in the 1960s contributed to the young College's prominence in conservative political circles. "Through the writings of Arthur Kemp in Modern Age and Harry Jaffa in National Review," Starr writes, "CMC emerged in the 1960s as one of the headquarters of the conservative intellectual revival then under way in the United States." 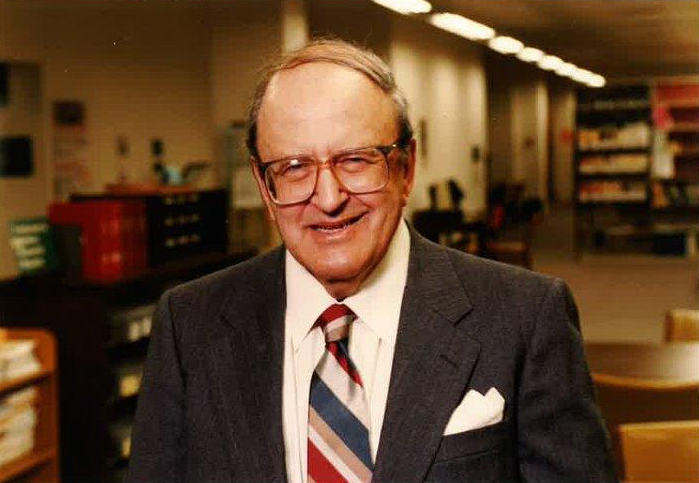 Born in 1918 in New York City, Jaffa received an undergraduate degree from Yale in 1939 and a doctorate from the New School for Social Research in 1951. He was a disciple of political philosopher Leo Strauss and started his long print career with the publication of his doctoral dissertation, Thomism and Aristotelianism, A Study of the Commentary by Thomas Aquinas on the Nicomachean Ethics, by the University of Chicago Press in 1952. Jaffa's arrival at CMC coincided with an era of faculty expansion highlighted by appointments across the spectrum of academic disciplines. The major appointments of that period included William Anderson in public finance, Chester Jaeger in mathematics, Kemp in money and credit, Loyda Shears in psychology, and Jaffa in political philosophy. Over the next 25 years, Jaffa would serve as author, co-author, contributing author or editor of dozens of important books from major university presses and more than a 100 publications and reviews in scholarly periodicals. This included his frequent contributions to the National Review, whose founder, William F. Buckley Jr., was a close friend. Buckley was the featured speaker at a celebration of Jaffa's 65th birthday held at the Athenaeum in 1984. Recently, political analyst Michael Barone, writing in his column "Beltway Confidential" for the Washington Examiner, praised Jaffa's elegant, thorough analysis of Douglas’ and Lincoln's views in his House Divided book, calling it as powerful today as it was when first published 55 years ago. As tributes continue to be posted online, many note how Jaffa frequently clashed with other conservatives over their interpretations of the Constitution and the Declaration of Independence in light of the Framers’ intentions. In his CMC history, Starr writes of other clashes as well—how, especially during the 1960s and 1970s, two decades of great social and political upheaval, Jaffa never hesitated to court controversy and confrontation either on campus (with colleagues, the College's administration, other member organizations of the Claremont Colleges) or in the world at large. A tribute in the National Review describes this inclination in another way: "Jaffa had a reputation as a master of the feud, particularly with people who mostly shared his views and commitments." That tribute also cites Buckley's quip that "if you think it's hard to argue with Harry Jaffa, try agreeing with him" and suggests that Jaffa's contentiousness was "plainly driven by a deep and earnest commitment to the truth and to the country." Additional coverage of Jaffa's passing can be read at the Power Line blog, Breitbart News, The Weekly Standard, The American Spectator and Ricochet.com. Full coverage at the National Review includes a Jaffa obituary and additional appreciation pieces by Richard Brookhiser, John J. Miller, and Seth Leibsohn. Jaffa is survived by a daughter, two sons, and several grandchildren. Read the New York Times obituary by Robert D. McFadden. Read the National Review obituary by Richard Brookhiser. Read the National Review obituary by Peter Augustine Lawler. Read the National Review obituary by Yuval Levin.